The story of a Cheese n’ Ham Toastie? Well, my story of how one saved the lives of 2 very hungry and tired people. Another rainy day north of Leeds, helping the expectant parents, who are chomping at the bit, and can’t wait for their Twins to arrive. I spent the day cleaning, washing, hoovering in anticipation of The Twins arrival. They still seem quite happy in Mum-to-be’s tummy, but I think that she is now looking more forward to meeting them face to face than carrying them around. Erik came along with me, in demand for his carpentry skills i.e. shaving tops and bottoms off doors to allow for the new carpets, and later on we worked as a team, trying desperately how to work out how to put the two cots together (I’m sure it was a lot easier in my day). Mum-to-be had driven to Manchester (with Eileen, her mum) to pick up ‘The Pram’. So Erik and myself frantically tried to work out which wierd screws matched which round nail heads to fit into which holes so that the cots would be all set up and looking good in The Twins now carpeted and wallpapered bedroom. Luckily all was finished in good time, which resulted in squeals of joy as Mum-to-be saw the completed cots. I had been kidding her that The Twins wouldn’t arrive until they knew they had a bed for the night, but as yet, they are still biding their time to enter our world. We returned home, ravenously hungry but tired. 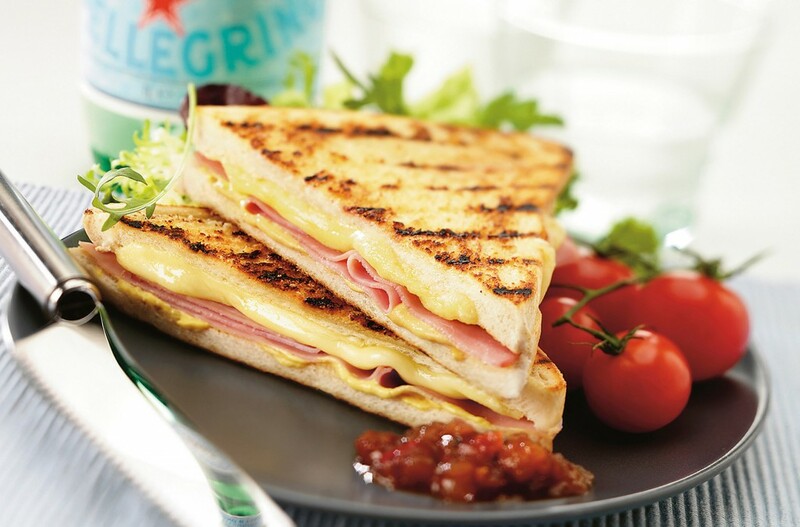 In my usual early-morning session on the computer (about 5.45am) I had been messing about on my desktop, and I inadvertently clicked on our photographer friend’s gorgeous photo of a cheese and ham toastie, and thought I must put this in for everyone to see. It looked so mouth-wateringly good and tasty that I wanted it right there and then – impossible, I know, but it just fitted the bill as an easy but pleasant meal for hungry, tired folk (me and Erik). One of the blessings of owning an AGA cooker is being able to use the simmer plate, complete with a circular piece of brilliant non-stick, heat-proof Bacoglide (available from AGA cookshops). Toasted sandwiches taste superb cooked on this surface. Often I love this as a light or quick meal if tired or going out to the theatre or cinema, and have it with salad leaves from the Kitchen Garden, tomatoes, red spring onions, radishes etc. At least 6 good quality cheese slices - Jarlsberg especially (or Port Salud, Emmenthal or Tallegio if Jarlsberg not available). Butter the bread slices. If the bread has crusts, cut off. Turn 3 of the buttered bread slices so that the non-buttered side is upwards. Cover three of the bread slices with the ham - then add at least 2 slices of cheese on top. Add mustard or chutney if you wish. Top with the other bread slices, buttered side upwards. Cut in either half, or triangles if almost square. These can be cooked in a heated frying pan, medium heat for 5-6 minutes turning once with a spatula or pallet knife when golden, or on the AGA simmering plate, on Bacoglide, for the same time. Meanwhile wash and spin the salad leaves, chop the tomatoes, onion and radish and dress. When the bread slices are golden and the cheese is just beginning to ooze out, the toasties are ready. Pile decoratively on a plate, and add salad. Enjoy! Hi – Many thanks for your comments. as you can probably tell, we are new to all this, and just finding our way. Love writing it, and hope we just get better and better.